Our annual general meeting is coming up on January 16, 2015. 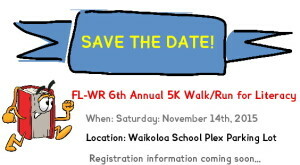 It will be held in the Waikoloa Village Association community room at 7:00 p.m. If you would like more information, please email us or contact any of our officers. 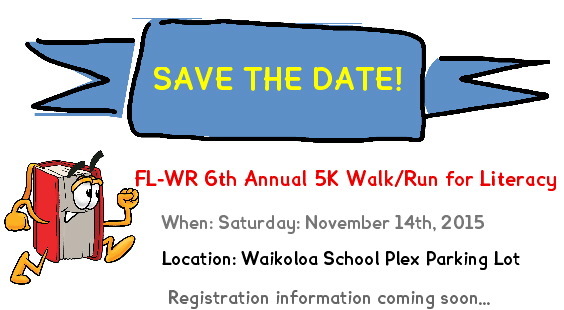 We will have exciting news about the progress of a “real” library for the Waikoloa region as well as what we have accomplished this year. Simply bring your HI-5 containers in to any of our 10 convenient locations. Inform any of our workers that you will be donating your items. Let them know what organization you wish to donate to (a complete list will be posted at every site). Our crew will process your load. You will receive a receipt for your records and we will mail the payment directly to the Non-Profit Organization of your choice! Recycling is important for our environment and it’s a simple way to give! Wednesday, Saturday & Sunday 8:00 a.m. to 3:30 p.m.
OPEN DAILY: 8:00 a.m. – 3:30 p.m.
Saturday & Sunday: 8:00 a.m. – 3:30 p.m.
Sunday: 8:00 a.m. – 3:30 p.m.
Wednesday, Saturday & Sunday: 8:00 a.m. – 3:30 p.m.